Jade Fever examines jade’s appeal as a global industry, a divine inspiration, a medium for artistic expression, and even as a precipitator of some bizarre crimes. Stan Leaming, Canada’s leading jade geologist, traveled the world in his hunt for jade--the beautiful, translucent, indestructible “stone of heaven.” As he tells about his travels, Leaming brings a unique insight to the history, science, and magic of the mysterious green stone, exploring its evolution from prehistoric tool to objet d’art. As you journey with Stan, you will meet key players in the jade industry, including former model Win Robertson (the “Jade Queen”), school-principal-turned-prospector Larry Owen, industry developer Kirk Makepeace, and many others. Rock hounds casual and serious will appreciate this comprehensive celebration of jade, enhanced by color photos of jade sculptures by Lyle Sopel, Deborah Wilson, David Clancy, and other well-known artists. In this fully revised edition, this guidebook now contains information not only on traditional metal detectors, but on computerized detectors as well. Information includes the history and development of detectors, detectors and their features, computerized functions and controls, selecting a detector and search coils, and advanced operation and use. This guide covers how to buy and use detectors, and is a complete, authoritative guidebook, perfect for home, the classroom, and in the field. Soft cover, 5.5” x 8.5” 432 pages. Hundreds of glowing minerals are shown in this invaluable field guide featuring over 800 beautiful color photographs, a comprehensive resources section, and helpful advice for collecting, caring for, and displaying minerals. The photographs illustrate samples from the United States, Canada, Mexico, Greenland, Sweden, Italy, and more, and show how the minerals look both in daylight and under UV light. Soft cover, 8.5” x 11” 191 pages. This fee mining guide is great for everyone, whether you are an experienced rock hound or prospector, or a family on vacation. Organized by state, this guide is filled with information on interesting sites to see and things to do related to rocks and minerals, gemstones, crystals, fossils, gold, and other geology fun. The book covers site information including seasons and days open, hours of operation, address and contact information, cost, tools and supplies needed, as well as history, regional attractions, and camping information. Includes sites in: Alabama, Arkansas, Connecticut, Delaware, Florida, Georgia, Illinois, Indiana, Iowa, Kentucky, Louisiana, Maine, Maryland, Massachusetts, Michigan, Minnesota, Mississippi, Missouri, New Hampshire, New Jersey, New York, North and South Carolina, Ohio, Pennsylvania, Rhode Island, Tennessee, Vermont, Virginia, West Virginia, and Wisconsin. Soft cover, 8.5” x 11” 264 pages. This revised and expanded edition is organized alphabetically by state and features site information including seasons and days open, hours of operation, address and contact information, cost, tools and supplies needed. It directs you to over 94 collecting locations, plus 150 museums, caves, points of interest, fairs, and festivals throughout the western states. Digging locations are varied and include fee mines, gold prospecting areas, sites to hunt rocks, minerals and fossils, and collecting adventure tours. Includes sites in: Alaska, Arizona, California, Colorado, Hawaii, Idaho, Kansas, Montana, Nebraska, Nevada, New Mexico, North Dakota, Oklahoma, Oregon, South Dakota, Texas, Utah, Washington and Wyoming. Soft cover, 8.5” x 11” 240 pages. An introduction to geology and collecting, this book presents over 200 rocks, crystals and minerals, enabling you to identify different samples through examination of color, structure, hardness, and place of origin. The book discusses the effects of plate tectonics and erosion, uses of rocks, crystals and minerals in the past and present, and covers imitation and synthetic uses for these three matters. This compact and comprehensive volume uses superb photographs, text, and at-a-glance symbols for easy reference to teach you all you need to know about rocks, crystals, and minerals. Hard cover, 5.5” x 8” 224 pages. This deluxe field guide and mini-encyclopedia is perfect for amateur geologists, rock collectors, and nature lovers. Featuring 500 full-color photographs and 300 drawings of crystals, this guide will help you identify, learn about, and collect minerals. Includes a fold-out guide: crystal systems at a glance. Soft cover, 5.5” x 8” 237 pages. Beautifully combine an amazing variety of cabochons and beads on sophisticated jewelry. Both beans and cabochons offer virtually unlimited creative possibilities for jewelry artists. In Beading with Cabochons, Jamie Cloud Eakin shows you the basic techniques and the unique stitches she developed over more than a decade. Her projects range from a pair of classic double-cabochon earrings to an elaborately fringed dichroic glass necklace. With so many cabochons and beads to choose from, each piece you make will be one of a kind. Hard cover 8.5” x 10” 127 pages. In this book you’ll discover the art of glass beadmaking and learn many of the secrets that were guarded for centuries by Venetian glassmakers. You’ll gradually build your expertise, beginning with the basic methods for making and decorating beans and working up to more advanced approaches. Dozens of techniques are described in step-by-step detail, and the text is liberally seasoned with “hot tips,” each designed to make learning easier and more fun. This book is lavishly illustrated with how-to photography and photos of works by more than 50 contemporary beadmakers, all in full color, making it a practical handbook and inspirational artists’ gallery all in one volume. Soft cover 8.5” x 10” 112 pages. Embark on a one-on-one journey with 14 glass bead artists as they create 30 projects and share their passion for their craft along the way. Author Susan Ray takes you beyond the ordinary stringing process and into the inventive realm using the individual artist;s beads to create fine jewelry and beaded accessories. Step-by-step instructions, clear illustrations, and stirring photography show how you an create stunning necklaces, earrings, bracelets, eye-glass holders, lariats and more. The Art & Soul of Glass Beads is a detailed and panoramic tour of the world of lampwork beads and their creators, breathtakingly and lovingly photographed by co-author Richard Pearce. The book includes 30 gorgeous projects, stunning photographs, bead stringing tutorials and pictionaries. Soft cover 8.5” x 11” 143 pages. 1000 tiny masterpieces literally glowing with creativity! Examine magnificent glass bead works of art including jewelry and sculptural pieces from the top names in the field today, as well as exciting works from emerging artists. Their exquisite designs reflect the diversity and innovation of beadmaking techniques from around the world. Simultaneously fine art and functional, wearable and collectible, these glass treasures will astound you with their originality and artistry. Soft cover 8” x 8” 408 pages. The Art & Craft of Making Jewelry is an indispensable resource for anyone with an interest in creating eye-catching, professional-looking pieces. Detailed illustrations make it easy to accomplish the techniques. Thirteen fashionable projects for earring, bracelets, pendants, and more feature the metalworking skills covered. Learn to mix materials and processes to create original works, and the result will be stylish, elegant pieces you’ll wear with pride. Hard cover 9” x 10” 176 pages. Handmade silver chains are actually miniature kinetic sculptures, created by joining together a series of links. Now you can learn how to make exquisite chains, as well as coordinating earrings, that will become the backbone of any jewelry collection. Complete with sophisticated projects and a thorough introduction to the basic techniques, Creative Silver Chains will show you how to create striking jewelry that will never be seen anywhere else. Hard cover 8.5” x 10” 110 pages. Take just a few hours to make wire jewelry so lovely you’ll wear it for a lifetime. Fun and fashionable, these simple projects will appeal to every taste and style, from adorable designs for teens to classic styles for adults. They’re inexpensive to craft, and call for just a few basic tools and readily available supplies. And because they look so chic-- thanks to the array of techniques and colors you’ll use-- it’s hard to believe that every one of them can be completed in so little time. Enjoy the many compliments you’ll receive-- you’re the only one who will know how easy making beautiful wire jewelry really is. Soft cover 8.5” x 10” 128 pages. Transform an array of nontraditional materials into creative, artful jewelry. Carles Codina and other highly original contributing artists demonstrate that it’s possible to make stylized, personal jewelry using very few resources. You’ll work with metal clay, polymer clay, wood, paper, rubberbands, and other everyday materials to create graceful rings, pendants, brooches, and earrings. Taking a fresh approach makes it possible to craft different and innovative jewelry. Hard cover 9” x 12” 160 pages. Using and easy-to-follow workshop approach, Kimberley Adams covers many of the major beadmaking techniques, starting with the simplest methods and ending with the most advanced. From making the first bead shape, such as a cone, to decorating it with surface treatments including enamel and gold leaf, she offers a complete, at-home course in this fascinating craft. You’ll refer to The Complete Book of Glass Beadmaking for years to come as your abilities develop and interest broadens. Hard cover 9” x 10.5” 176 pages. Be creative, be daring, be dazzling, be delighted by beads! Anyone can learn to make incredible earrings, necklaces, bracelets, pins, barrettes, and other accessories, ranging from dainty and elegant to bold and funky. Use seed, glass, antique, stone, silver, wooden and other types of beads, as well as crystals, cabochons, charms, and more--even make your own beads out of polymer clay, fabric, paper, or bamboo. With gorgeous full-color photos, bead-by-bead instructions for more than 55 projects, and helpful tips from experts, you’ll soon be stringing, wiring, looming, and weaving your way to a whole wardrobe full of beautiful beaded jewelry! Soft cover 8.5” x 10” 143 pages. Craft stunning jewelry using metal clay, an amazing art material with the versatility of clay and the brilliant beauty of silver or gold. In its unfired form, metal clay is soft; you can manipulate it just like other clays. The magic happens in the firing process, once the metal particles in the clay become pure precious metal. From Simple Weave earrings to a Water and Pebble pendant, these projects incorporate an exciting range of clay and jewelry-finishing techniques and materials. Hard cover 8.5” x 10” 144 pages. Ready to enjoy making and designing your own jewelry? Here’s the most complete beginning bead-stringing primer on the market. Get Started Stringing Beads contains everything you need to know to start making beaded jewelry right now. This must-have book has more than 100 illustrations using clear photography and crisp drawings to pump up your shopping and stringing savvy. And best of all, you get detailed explanations from one of the most talented, engaging bead editors in the country, who personally coaches you on: how to shop for beads, bead types, stringing materials, crimping, tying knots, working with findings, ideas for working with a focal bead, how to finish your projects, and designing your own jewelry. Jump-start you creative side with the stunning projects, little-known tips, up-to-the-minute bead resources, and simply gorgeous design ideas. Hard cover 8” x 8” 88 pages. Making Polymer Clay Jewelry is packed with fantastic projects, from earrings and hair clips to mosaics and brooches. With clear illustrations and simple instructions, even a complete beginner can make stylish accessories. More experienced craftspeople will enjoy the variety of new techniques described for this spectacular medium. Soft cover 8.5” x 10” 126 pages. This invaluable introduction to the basic skills of simple jewelry making is perfect for beginners. Every technique is photographed in color step-by-step with likely pitfalls explained, as well as tips on how to avoid them. More than 30 original and stunning projects are explained so that making beautiful jewelry has never been easier. Soft cover, 127 pages, 7.5” x 9.5”. More than 100 findings and finishing techniques are included in this essential beadwork guide. You will learn to attach clasps and closures ranging from simple and classic to wildly original, embellish projects with knots, edging, and fringes, create wirework findings that add elegance and style, and personalize items with your own flair design. With color photographs, illustrations, and a gallery of stunning beadwork, you will be able to transform humdrum jewelry into stunning, one-of-a-kind artwork. Soft cover, 118 pages, 8.5” x 9”. This all-in-one resource for working with Art Clay Silver and Gold clay will teach you how to handle Art Clay and manipulate it through minimal stages, ending with a nearly pure silver heirloom. 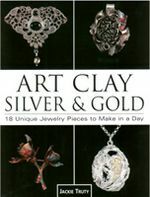 This book features 18 silver and gold jewelry pieces you can make in a day or less, clear, easy step-by-step directions and abundant photographs, as well as tips on how to add stones, cabochons, and wire. Soft cover, 128 pages. Hundreds of bracelets illustrate the versatility, diversity, and beauty of a simple form. As you look through this illustrated survey, you’ll realize that the concept of what defines a bracelet is open to infinite interpretations. Knitters, beaders, wood carvers, ceramicists, and other artists from around the world join celebrated metalsmiths in these pages. Whether you are an artist, collector, or jewelry enthusiast, these designs will continue to fascinate you. Soft cover 8” x 8” 408 pages. A ring today is much more than a band to house a finger. The examples in this book, the best of contemporary ring design, are miniature sculptures, compact platforms on which ring-makers display their art. Rough hewn or precisely cut and polished, meticulous or improvised, stark in their simplicity or extravagant in their complexity, these designs will astound and delight you with their originality and beauty. Soft cover 8” x 8” 416 pages. This outstanding collections of 500 contemporary brooches showcases the inventive design and technical virtuosity of artists from around the world. It features both traditional and avant-garde approaches to the art of jewelry making. Some pieces are formed from precious metals and gemstones while others are fabricated from found objects. Some are simple and practical while others are elaborate and eccentric. This diverse and beautifully presented collection will inspire jewelers, collectors, and art enthusiasts alike. Soft cover 8” x 8” 360 pages. Join volcanologists as they explore the ever-changing, sometimes dangerous world of volcanoes. Learn how these powerful forces form, what causes their eruptions, and the devastating effects they can have on Earth. Detailed illustrations reveal the internal, hidden structures of volcanoes. Full-page scenes transport the reader to places of volcanic activity- past and present. Lavish artwork captures volcanic activity- from hot springs and geysers to volcanoes on other planets. Hard cover 9.5” x 11” 31 pages. This activity book helps kids discover geology with fun and educational experiments and activities. Projects include making sandstone, creating imitation marble using special coloring, making a fossil cast, build a homemade seismograph to measure quaking movement, build with miniature adobe bricks, watch crystals grow, bake delicious cookies that look like metamorphic rock and 43 more fun activities! Soft cover, 8.5” x 10” 144 pages. This book is designed to make information easily accessible and has information from hundreds of sources. Hundreds of color illustrations and pages of text representing years of intensive research and experimentation make this book a text as well as a tool. The student edition gives solid must-have information that is appropriate for entry level students, hobbyists, and casual metalsmiths. Thick soft cover, 153 pages, 5” x 8”. This book is designed to make information easily accessible and has information from hundreds of sources. Hundreds of color illustrations and pages of text representing years of intensive research and experimentation make this book a text as well as a tool. The Pro Plus edition comes with a CD that contains calculation software, video clips, the full text rendered as an electronic file, as well as two other books by the same author, Practical Jewelry Rendering and Design Language. Hard cover, 299 pages, 8” x 9.5”. Beautifully enhance the radiant surface of metal with embossing, an exciting craft for creating raised designs. The more then 20 fast and easy projects will enable you to make many lovely patterns--from decorative motifs to floral landscapes to animal prints--using aluminum, copper, and brass foils. Try all the embossing techniques in a sampler that you turn into a picture frame. Create stylish trim and adorn your photo album, or use flat relief to embellish a mirror frame. And make a delicate floral pattern on a metal ring as a unique candle decoration. Any home accessory looks great with embossing! Soft cover 8.5” x 11” 80 pages. A complete course in enameling for beginners and more advanced artisans. Artist and educator Linda Darty demystifies enameling and shows how it can be used to add rich color, texture, and imagery to metalwork. Once you learn the basic enameling techniques, you’ll be able to apply them on 12 handsome projects, from “Stencil and Sgraffito Sifted Earrings” to a “Fold-formed Bowl.” Hard cover 8.5” x 10” 176 pages. Enhance every room with functional and attractive decorative metal accents. Make beautiful home accessories from metal without a torch or soldering -- if you can use a hammer and saw, you’re already off to a great start. One-of-a-kind projects include the copper “Gingko Leaf Chopstick Rest” to help you set a tranquil table, and a modernist “Mail-Call Sorter” that’s sure to keep you and your decor up-to-date. Personalize your designs to reflect your style. Hard cover 9” x 10.5” 127 pages. The French call lost-wax casting cire perdue, which translates to “wax lost” or “wax wasted.” Some people think that lost-wax means that the technique was lost. Nothing could be further from the truth, since the technique has been in continuous use for over six thousand years and is still used today by dentists, jewelers, and in other industries. Many of the ideas presented here are not original. I listened to experts, had discussions with other craftsmen and scientists at companies that produce the tools and supplies we use. I’ve picked up ideas from the internet and engaged in useful discussions at various workshops. Sometimes I have performed experiments to find out whether some idea works or not, or to determine the optimum time or temperature for a specific procedure. Some of the methods presented will be quite different from the “usual” approach, but I’ve tried to show the rationale for the alternative approach based on scientific reasoning or practical experiments. This book will be useful to craftsmen with a limited budget as well as the technician working in a well-stocked shop. I have offered homemade solutions to many of the equipment problems as well. Soft cover 7” x 9” 220 pages.